Most people like to save space in their bathrooms and shower stalls. They like to avoid bulky shelves that can protrude from the walls and take up valuable room. However, this is easier said than done because we all have common products like shampoo, soap, and conditioners on hand. After all, you can’t really step out of the shower every time you need them. Niche shelves are embedded in the walls and provide ample space to store your products. They can be as big or small as you like and can be perfectly positioned according to your height requirements. Because they are embedded in the wall, you don’t have to worry that they’ll take up space or cause any accidental injuries. They’re also relatively quick and easy to install. We usually get this type of project finished within a day. 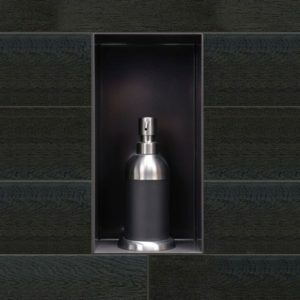 When our clients install steel niche shelves, they usually opt for tiles or ceramic materials. These materials are ideally suited for wet environments like a shower and can last for a very long time. However, it’s expensive and time consuming to install ceramic niche shelves. You need to cut into the wall and create a base before you can install the tiles on the base. Steel niche cabinets are pre-fabricated. You don’t need cut out the wall or create a base. These can simply be installed between wall studs so there’s no need for any border or tile work. Steel shelves also have a natural slope to them and can direct water away from the bottom sill easily. You won’t have to clean the shelf after every shower you take. Our supplier Ridalco Industries supplies two different kinds of steel niche shelves, mirrored and brushed stainless steel. You can choose one based on the overall décor of your bathroom and shower. Both of these shelves are well-designed and well-manufactured. They are made from high-quality materials that will not rust or get damaged in the humid and wet environment of your shower. Another benefit is that these shelves are also very easy to clean and maintain. If you want more information or have questions on niche shelves, our experienced installers at Gordmay Construction can help you. Contact us by filling in this contact us form.